At Gulfstream Park this winter the average field size grew 13.1 percent from 8.4 to 9.5 horses while average daily all-sources handle slipped 1.7 percent but was still an impressive $8.1 million. Those numbers are for the race meet from Dec. 6, 2014 to April 5, 2015 and are a combination of a Gulfstream news release May 4 and Blood-Horse’s follow-up review of Equibase Co. data. Gulfstream field sizes jumped year-to-year largely because 2013-14 was the one season of head-to-head weekend racing between Gulfstream and its South Florida neighbor Calder Casino & Race Course. Gulfstream had the South Florida market to itself in 2014-15. 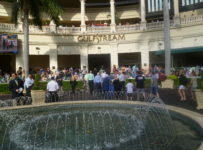 The recent Gulfstream meet’s extraordinarily large fields provided bettors with mouth-watering payoff opportunities. Handle remained high even though a contract dispute took away some important simulcast outlets in northeastern states. Gulfstream said total all-sources handle for its championship meet (winter meet) grew from $691 million in 2013-14 to a record $704 million in 2014-15, for a 1.9 percent increase. 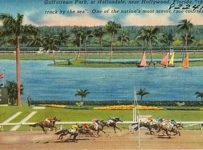 The per-day averages for the Hallandale Beach, Fla., track were $8.3 million for 83 race days in 2013-14 and $8.1 million for 87 race days in 2014-15. Gulfstream did not provide breakdowns of live and off-site handle, and those numbers are not readily available. Blood-Horse research indicates Gulfstream’s average field size was highest among major U.S. tracks during the past winter and that its average daily all-sources handle was second to Santa Anita Park. Gulfstream’s record for daily average all-sources handle was $8.6 million in 2012-13. 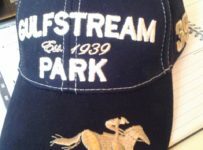 It is highly possible that Gulfstream would have broken that record in each of its last two winter meets if not for the Calder competition and the lack of handle from tracks in the MidAtlantic Cooperative. * From July 1, 2013 through June 30, 2014 Calder in Miami Gardens, Fla., and Gulfstream raced head-to-head Fridays through Sundays. Calder averaged about $1 million per day in handle during several of those months. Competition from Calder had an undetermined impact on field sizes at Gulfstream. 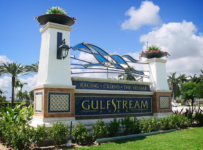 Last July 1, the two tracks signed an agreement under which Gulfstream is leasing Calder’s racing operations through 2020–thus ending head-to-head racing. 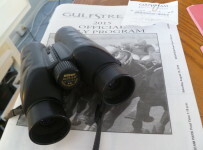 * From the start of its 2014-15 meet through late March Gulfstream’s simulcast signal was among those not available to the 23 tracks and their related wagering outlets that are members of the MidAtlantic Cooperative, a group that negotiates simulcast host fees. Gulfstream is among about a dozen signals distributed by Monarch Content Management, a subsidiary of The Stronach Group which is Gulfstream’s parent company. 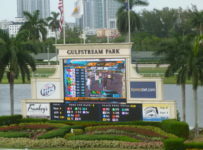 Amid a dispute over pricing, Monarch was not sending the signals of Gulfstream, Santa Anita, Tampa Bay Downs, Laurel Park, and several other tracks to members of the cooperative. Parx Racing, Penn National Race Course and Delaware Park are among members of the cooperative. 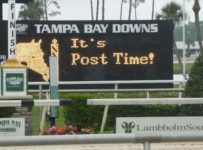 Gulfstream is not commenting on that now-resolved dispute. But one point of reference is that Tampa Bay officials said in February that it was costing them about $350,000 a day in handle. That indicates that the impact on Gulfstream may have been $700,000 a day or more. Gulfstream said its average field size grew from 7.5 horses in April 2014 to 8.4 in April 2015. Average daily all-sources handle grew from $3.9 million for 12 days in April 2014 to $4.6 million for 22 days in April 2015. 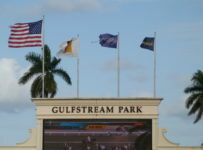 Gulfstream began its six-month summer meet April 8. Meet was a huge success,” P.J. Campo, general manager of Gulfstream, said in the May 4 news release. 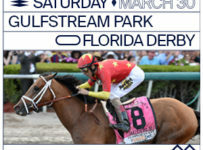 Gulfstream established new standards for Florida Derby day and the March 28-29 weekend. 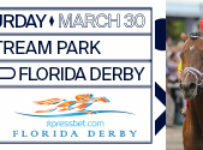 Total handle on Florida Derby Day was $27.2 million, up from $26.8 million the previous year, while the total two-day weekend handle of $37.2 million exceeded the previous record set last year of $36 million. 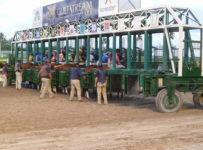 A new standard was also established in the new building, which opened in 2006, with a record on-track Florida Derby Day handle of $3.3 million. 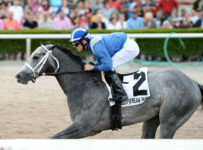 Campo said he’s pleased with the increases in total handle and field size during the first month of the six-month summer meet and is looking forward to what he expects will be Gulfstream’s most successful summer meet with a $4.7 million stakes schedule. 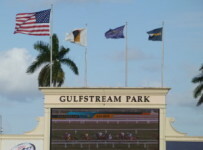 “There’s so much more happening at Gulfstream this summer than ever before,” Campo said. “We are looking forward to reestablishing the $1 million Summit of Speed with two Breeders’ Cup Challenge Win & You’re In races in the Princess Rooney (gr. I) and Smile Sprint (gr. II). The Summit of Speed with sprint stakes was one of Calder’s major days, but was not held in 2014. 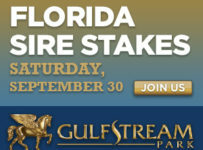 Under the lease Gulfstream is holding 40 days of racing each year at Calder, and is using the name Gulfstream Park West for those race meets. This year’s meet will be from Oct. 7 to Nov. 29.